In 1898 Thomas George Pascall of South Norwood took over the Platt Brickfields from a Captain Walmersley however shortly before this, in 1896, he also opened successful works at Elmers End – continuing the business of brick and tile manufacturing that his great-grandfather established in 1798. He would devote the rest of his working life to his new venture in Platt and is notable for being the supplier of many bricks for the area – including those used to construct the Platt Memorial Hall. In later life, he became the Chairman of Platt Parish Council and a Magistrate on the Bench at West Malling. On 21 February 1895, Thomas and his wife Martha Mary Pascall (née Osborne) had a son named Thomas Osborne Pascall, who was born in South Norwood. By 1911 the family were living at 118 Woodside Green, and young Thomas educated at the Whitgift School in Croydon. There is no evidence that Thomas Jnr. ever resided in Platt, although his parents and two younger sisters Elsie and Vera moved to Holly Mount (near the Brickfields) around 1916. Before this Thomas Snr. stayed with the Bennett family whenever he was working in Kent, and it’s possible his son may have accompanied him while learning about the family business. Young Thomas enlisted in Epsom during September 1914 and joined the 19th Battalion, Royal Fusiliers (City of London Regiment), which was one of four regimental public school service battalions formed after war broke out. During July 1915 the Fusiliers were briefly sent to Clipstone Camp in Nottinghamshire before returning south to Tidworth in August for final training at Perham Down on Salisbury Plain. Thomas was eventually posted to France with his unit on 12 November 1915 as part of an advanced party of three officers and 124 other ranks from the battalion that arrived in Le Havre on the 14th. The rest of the battalion arrived in France a month later on 14 December, and Thomas joined up with them two days later. On the 20th the Fusiliers entered billets in Béthune but were sent to the trenches the next day when they took over a relatively quiet part of the line near Givenchy known as ‘Windy Corner’. Thomas, in No.4 Company, would have spent Christmas Day in the trenches, and the following day marched a short distance to the line near two neighbouring villages called Hingette and Avelette, which were just north of Béthune. Cuinchy bred rats. They came up from the canal, fed on the plentiful corpses, and multiplied exceedingly. While I stayed here with the Welsh, a new officer joined the company… When he turned in that night, he heard a scuffling, shone his torch on the bed, and found two rats on his blanket tussling for the possession of a severed hand. New Year’s Day passed without incident; however a reasonably sized gap in the wire had been spotted, and following a night patrol, was reported to have been cut by hand, indicating that perhaps an attack was imminent and the battalion readied themselves for an assault; however, nothing materialised. At daybreak the following day, the situation changed, with an enemy plane spotted overhead signalling the start of a fierce artillery bombardment of the British front, third and support lines which coincided with the front-line units being relieved. There was some excitement when word spread that three spies were living nearby, and as the relief continued, the bombardment intensified. 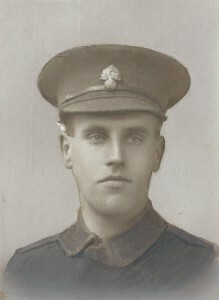 Shortly after 11:00 am, while Thomas was sheltering in the front trenches, the Germans fired over a large mine that killed him and seven others from his company, as well as wounding several others. In an act of open bravado, seemingly the Germans who sprung the mine were observed standing exposed above their parapet, perhaps so they could see how much damage they had inflicted but soon returned to the safety of their trench. Thomas is buried in Woburn Abbey Cemetery, Cuinchy and in addition to the Platt War Memorial, he is also commemorated on the Croydon Roll of Honour and in the Whitgift Book of Remembrance. Photograph of Thomas courtesy of David Stone.